firstly, thanks to "2muchfun" for sending me an extra cruise stalk so i don't have to risk damaging the one on my car for figuring this out. anyways, i decided to take it apart to see just how complicated it would be to make it have the right values. 2)the stalk then just pulls out and up to remove it. the changes here are pretty simple, all three resistors need to be changed and the white "D" wire needs to be connected to the red wire. reassembly just snaps all back together. EDIT: I should add that this does not apply to Canadian models, because apparently they use a different switch/ECU combination where there are no resistors in the switch. Each function utilizes a completely separate pin on the ECU where each button press results in a temporary continuity to ground on that particular pin (I like this better). hey, those are what i was looking for. also, note that the MR2 circuit doesn't have these wired in series, so the total values are the values we need. This is great! I am glad that I finally helped with something. Good work Marc as usual!!!!!! Sorry to drag this up, but did you get this working Marc? I connected up the speedo to the clocks and ran the speed signal back from the clocks to the ECU Plug E pin 8. Since then it has setlled down and drives fine, the code hasn't come back after clearing and I'm seeing a VSS on my OBD2 scanner. Did you get that initially? I've bought a cruise stalk and hoping to do the modifications shown above and if it works then I'll be a happy man! i never did do this stuff myself. but i'm not surprised the engine had to learn that it could not shift the transmission again when it saw a VSS. i would not expect long term effects from that. did you confirm the vss difference between the 2gr and the mr2? example: at 50mph indicated, the 2gr said it was traveling 60mph or something like that. the speeds don't need to be the same but they need to be in the right ballpark becuase the ECU will speed limit you over 115 or 125mph and it won't engage cruise below 30mph. I only managed to check it had a VSS with the back end of the car in the air and the car idling in 2nd gear but never noted what speed it was, so shall check that again! I've purchased an extension cable now so I can run the scanner into the cabin and check properly on the road. If all goes well I'll get the cruise stalk modified and get it run into the car, shall report back how it goes. Last edited by Gripper; February 17th, 2012 at 12:04. Anyone have this working, confirmed??? So Im trying to get this cruise control thing working since it seems many have done it already. 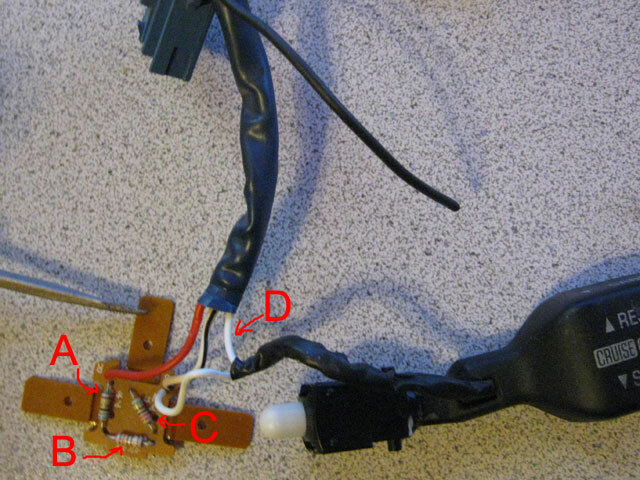 I have my speed sensor working I have the STP+ - inputs ran through a spdt relay off the brake light wire. STP- gets power with no brake and IG on. 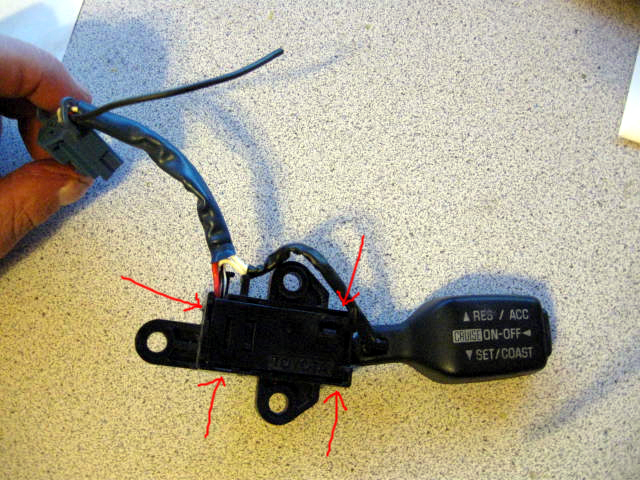 STP+ gets power when the brake is pressed and turns the relay off on STP-. That is how I read the diagram. I modified my stock switch with a 220, 460, and 1k resistors. Thes fell into the acceptable ranges but I still dont get cruise to work. I have an 06 RAV4 Ecu. How did you wire the switch up to the ecu? The MR2 switch has on/off as a separate circuit from the other functions. You can tie the white and red wires together and run them to the single ecu input and ground the w-b wire. Im getting a camry CC switch this week to try it out. Ill also reset my ecu I guess. I'm glad to see this thread come back. Please keep it updated as you get your cruise online. I have the resistors in the values Marc listed above, and was waiting for spring break to tackle my attempt at getting it to work. I have the RAV4 4x4 ecu without an immobilizer. Im not sure that makes a difference or not. 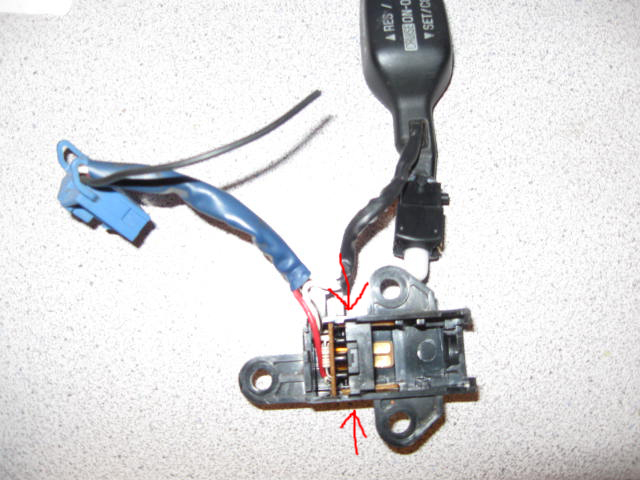 Cruise switch is the factory Camry 2 wire switch with one side to GND on the chassis and the other side going to the CCS pin on the ecu. I have BATT voltage on the ecu CCS pin with IG on. I get the correct voltages when each button is pressed on the switch as well. STP+ and - are ran through a SPDT relay. Common is IG+ , STP- is NC STP+ is NO. 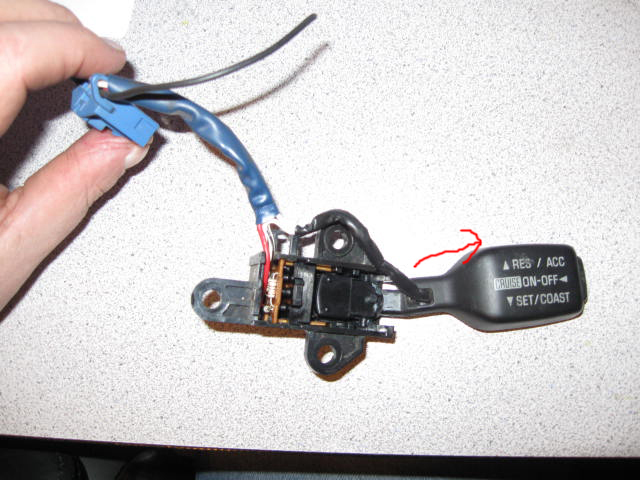 I use the brake light wire + to trip the relay. ECU is wired in D range from IG+. The only thing I can see different in my wiring than in Paul's (he has cruise working) is that he has STP- and STA wire into IG+. I have STA hooked to the starter relay and STP- wired correctly through a relay. I can move some jumpers around and try STA hot all the time I guess. I think that would run the Fuel Pump when the car is stalled though. Other notes. 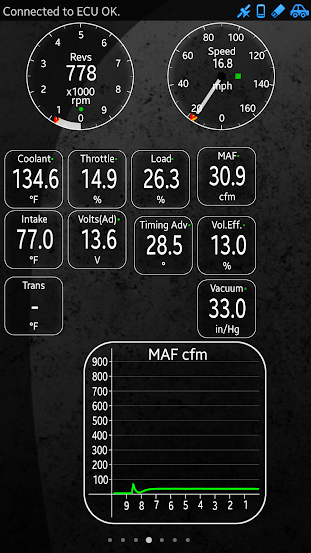 Car drives and idles completely normal, I only have about 5 drive cycles on the engine. Last time I checked I only have 4 CEL codes. Both rear O2 sensors, Trans solenoid A, and Evap Canister high. Ok, I tried a few combinations of different wiring with no success. Wired STA to IG2. That put the car in limp mode. Wired STAR to IG2. That had no affect. Wired D4 to IG2. No affect. Im getting nothing to indicate the cruise shouldnt work. I want to swap in a 2wd ECU and see if its not liking the 4WD missing? Other than that Ive pretty much given up on this. Unless someone besides cyclehead has this working that can chime in. I have all his notes and it still didnt work. I did some more reading on the matter via RAV4 forums and it seems that the 4WD ecu turns VSC, 4WD and Cruise off for almost anything CEL related. I talked some more with cyclehead and I think he is running the 2WD ecu. The searches I did on the 2wd doesnt show cruise being disabled near as often. I may try to send cyclehead my ecu next month and have him test this theory. If so Ill be selling my 4wd ecu for a 2wd one. Here is the list of codes he normaly has. I have evap and secondary O2 codes. He said the secondary o2 has thrown efficiency codes on his and cruise still worked. I tested mine with the rear o2 and still no cruise. I guess I'll try the evap sensor next. Problem solved, only the 2wd RAV4 ecu will work with cruise. You will also need the speed sensor wire hooked up, and both brake inputs. Well crap, 4wd ECU right here. When talking about connecting the red and white wires, how do you mean to connect them? Do you cut one and connect the cut end to the other wire? Do you just strip a bit of both of them and join them that way? Either way, I chose to tie then both together where I joined it to the wire I have running all the way back to the ecu. If you look into the 2AZ manual transmission ecu, There is a clutch switch for cruise control that basically tells the ecu that you are in neutral every time that you clutch in. A separate switch from the clutch start switch.